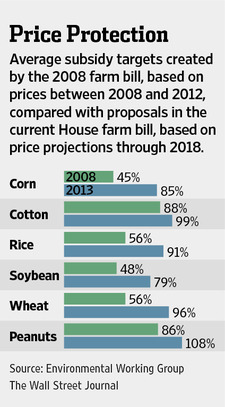 Peanut, cotton and rice farmers are big beneficiaries of price guarantees tucked into agriculture legislation under consideration on Capitol Hill. But another big winner may be producers of what is known as sticky rice, the kind used in sushi and other Asian dishes across America—and grown by a congressman who helped push for the provision. The federal subsidy in the House bill guarantees farmers of Japonica Rice that if market prices drop below 115% of the average price of all types of rice, they will get a government payment to make up the difference. Japonica is the formal name for medium- and short-grain rice strains commonly called sticky rice. Rep. Doug LaMalfa (right), shown last year when he was in the California state Senate, is a fourth-generation Japonica Rice farmer. The move shines a light on guarantees against drops in commodity prices that are in some ways replacing the much-maligned direct payments to farmers Congress is seeking to end. Subsidies for products such as corn, wheat and cotton cost taxpayers about $5 billion a year. Rice growers have received a total of more than $2.6 billion in subsidies since 1995, according to the Environmental Working Group, a liberal advocacy group that is tracking government spending on the agriculture industry. The sticky-rice provision won strong support from, among others, two Northern California lawmakers from neighboring districts, according to congressional aides and people working with the rice industry: Freshman Republican Rep. Doug LaMalfa, a fourth-generation Japonica Rice farmer who sits on the House agriculture committee; and Democratic Rep. John Garamendi, a rancher and pear farmer. Mr. Garamendi said U.S. farm policy is moving toward price-loss coverage programs to replace direct subsidies to “cover multiple varieties of losses, including price collapse.” Mr. Garamendi, who said he helped fashion the rice provision, called the insurance program a “significant improvement” over direct subsidies. 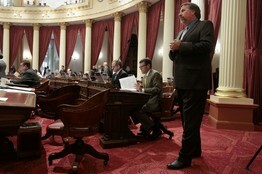 Kevin Eastman, a spokesman for Mr. LaMalfa, said the lawmaker wasn’t available to comment. Mr. Eastman said the agriculture committee has been working on changes to rice language since last year, before Mr. LaMalfa was elected. He called the House provision a “technical correction” addressing regional differences in rice varieties, pricing and production costs. He didn’t respond to questions about Mr. LaMalfa’s role in the farm bill. Rep. Jim McGovern (D., Mass. ), a member of the agriculture committee, criticized the “generous” price guarantees. “We claim to be cutting the direct subsidy system, and instead we’re creating a safety net for big agribusiness,” he said. Mr. McGovern added that the bill was written behind the scenes and presented to the committee. “When I raised questions about the price-protection provisions, you would have thought I’d committed treason,” he said. In the price-protection program, farmers get subsidy payments if a commodity slumps below a target price, a percentage of an average price determined annually by the Agriculture Department. The Senate, which has passed a bill, and House, which could vote early in the next week, would still need to work out a final version. The Senate bill doesn’t single out California Japonica rice. In a bow to powerful Southern lawmakers, both the House and Senate versions have high price guarantees for peanuts, cotton and rice. Disagreements between Republicans and Democrats over how much to cut back on food-stamp assistance and other farm-support programs could block passage of a farm bill this year. House efforts to produce one fell apart last year, leading to a one-year temporary extension of many programs. Charley Mathews Jr., a Marysville, Calif., farmer who is chairman of the California Rice Commission, a lobby group, said Mr. LaMalfa promoted subsidies for rice growers as a state senator and promised farmers he would fight for Japonica rice when elected to Congress. The LaMalfa family farm has received almost $4.7 million in farm subsidies since 1995, including nearly $1.2 million in direct payments, according to EWG. The executive director of the California Rice Commission, Tim Johnson, said standard crop insurance provides few benefits to rice growers, because its primary function—protection against floods—isn’t useful. Rice growers fear prices could drop because of potential hurdles thrown up by governments in prime Asian export markets. Mr. Johnson, however, also said California farmers don’t expect the subsidies to kick in because the price of Japonica rice has been relatively stable. A version of this article appeared June 15, 2013, on page A7 in the U.S. edition of The Wall Street Journal, with the headline: A Rice Gets a Price Premium. This entry was posted in Uncategorized and tagged Rice by admin. Bookmark the permalink.